Published By – Edgewater Music Inc. Published By – B. Feldman & Co.
- Track 1, "Freestyle Noize", contains samples from "Caught, Can We Get A Witness", "Bring The Noise" and "Show 'Em Watcha Got" by Public Enemy licensed courtesy of Def Jam Records. Published by Fresh Songs/Chrysalis Music/Bucks Music/Island Music/Bring The Noise/Copyright Control. - Track 2, "Dancehall Vibes", published by Fresh Songs/Chrysalis Music/Jamdown Music/Copyright Control. - Track 3, "Drop The Boom", published by Fresh Songs/Chrysalis Music/MCA Music Publishing/Copyright Control. - Track 4, "Don't Stop", female vocals sampled from Bowa feat. Mala - Different Story (1991) [uncredited]. Published by Fresh Songs/Chrysalis Music/IQ Music/Copyright Control. - Track 5, "Here We Go", published by Fresh Songs/Chrysalis Music/Edgewater Music Inc/Zachron Publishing/Carlin Music/Copyright Control. - Track 6, "The Darkside", contains a sample from "Shut 'Em Down" by Public Enemy licensed courtesy of Def Jam Records. Published by Fresh Songs/Chrysalis Music/Complete Music/Bucks Music Group/Island Music/Bring The Noise/Copyright Control. - Track 7, "B-Boy Stance", published by Fresh Songs/Chrysalis Music/Jamdown Music./Westbury Music/Prophesy Music/Copyright Control. 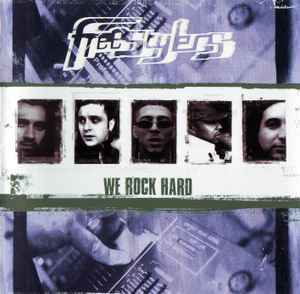 - Track 8, "We Rock Hard", published by Fresh Songs/Chrysalis Music/BMI/Copyright Control. - Track 9, "Breaker Beats Part 1", published by Fresh Songs/Chrysalis Music/Copyright Control/Holly Bee Music. - Track 10, "Breaker Beats Part 2", published by Fresh Songs/Chrysalis Music/Warner Chappell Music/Copyright Control. - Track 11, "Scratch 22 (Jay Rock's Theme)", produced and arranged at Monroe. Published by Just Isn't Music. - Track 12, "Ruffneck", published by Fresh Songs/Chrysalis Music/MCA Music Publishing/Copyright Control. - Track 13, "Feel The Panic", contains a sample from "It Takes A Nation Of Millions To Hold Us Back" by Public Enemy licensed courtesy of Def Jam Records. Published by Fresh Songs/Chrysalis Music/Copyright Control/Bucks Music Group/Island Music. - Track 14, "Hold Up Your Hands", published by Fresh Songs/Chrysalis MusicCopyright Control/B.Feldman And Co./EMI Music Publishing/Greensleeves. - Track 15, "Warning", published by Fresh Songs/Chrysalis Music/MCA Music Publishing/Copyright Control. Released under licence by Play It Again Sam. 8-page booklet with images, credits and 'thanks'.